Increasing winds with thunderstorms likely - a few could become severe during the afternoon hours. Damaging winds, large hail and possibly a tornado with some storms. High 76F. Winds SSE at 20 to 30 mph. 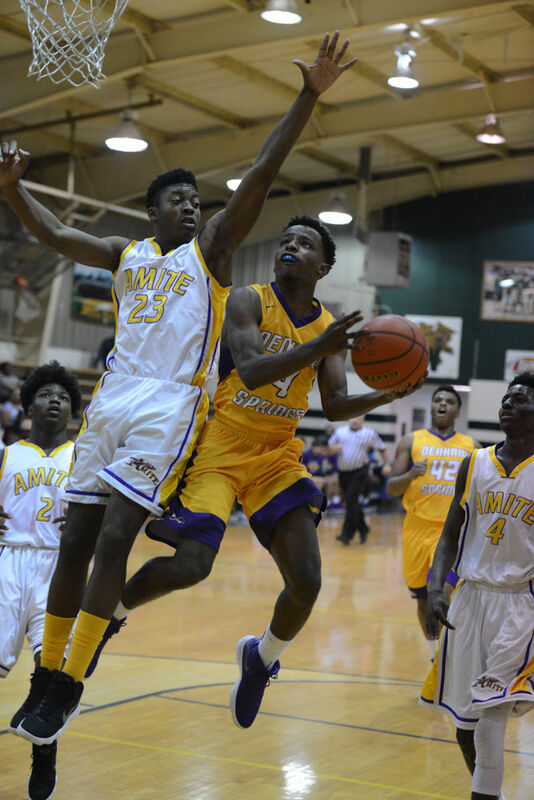 Chance of rain 90%..
Denham Springs guard Micah Banks (4) is shown in action during the 2017-18 against Amite. DENHAM SPRINGS – Last season’s Denham Springs basketball team didn’t win a parish championship, District 4-5A title or make a deep postseason run. But it still managed to endear itself to coach Kevin Caballero for a triumph that superseded any that occurred on the court. “It’s probably the most memorable team I’ll have because of the circumstance those kids faced,” Caballero said. With the great majority of a team that suffered through a flood-ravaged 10-23 season in 2016 – one devoid of postseason competition – the Yellow Jackets were a shining example of the ability of the human spirit to persevere over adversity. That was the 2017-18 Denham Springs team in a nutshell, with its core group of players still intact after its nightmarish season the previous year, thriving under a sense of normalcy that included a return to their lives at home, at school and on the floor. Returning players such as guards Micah Banks, Kaleb Drummer, DJ Williams and post player Xavier Miles, like Caballero, suffered differing degrees of damage to their homes and upheaval in their personal lives two years ago at the hands of the Great Flood. 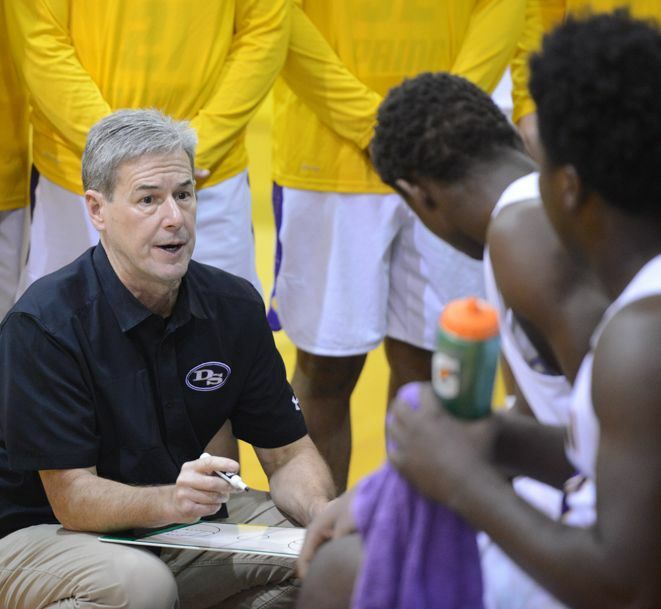 Having endured through the tumult of the previous season Denham Springs started the 2017-18 season fast with nine wins in its first 10 games, displaying a dramatic turnaround in games decided by 10 points or less with a 12-3 record. After a near miss (56-55 loss) on Jan. 8 against eventual Class 5A state champion and parish rival Walker, the Yellow Jackets defeated Covington (75-64) in the opening round of the state playoffs. That set up a lengthy road trip to top-seeded Natchitoches Central, which in its last two games against Denham Springs, had defeated the Yellow Jackets by 32 and 30 points, respectively. Denham Springs pushed the home-standing team to the wire, eventually dropping a 75-64 decision in a game that went a long way cementing the Jackets’ road back to respectability – a 23-10 record – as well as setting a tone for the 2018-19 season. Banks credited Caballero with a masterful job of keeping a splintered basketball team together through very trying times the year before. If not for that leadership exhibited by Caballero, Banks shutters to think where the program would have been going into last season as the Yellow Jackets’ fortunes appeared uncertain. The Great Flood of 2016 had such an impact. Banks said his family’s first thoughts were to remain at home after an initial rainfall had receded from his yard and beyond the street. The next wave of heavy rains, though, changed those plans and with Banks’ father driving a Tahoe, got his family out ahead of rising water that would eventually push more than 3 ½ feet into their home. Banks said they encountered traffic snarls and rising water on I-12, forcing his father to drive on the outside of the right lane en route to Plaquemine, where they were forced to stay with family for two months. Caballero recalled equating the scene of pelting rains and flooding to something you would have seen on television. But he soon realized his own home, much like of Denham Springs, was under siege and required swift action as Caballero and his wife were evacuated to Walker and then to another location later that same evening. He counted his mother, sister, two brothers and aunt among flood victims who sought shelter from their flood-damage homes. Comparatively speaking the recovery process for Banks’ family moved along rather rapidly, resulting in a move-in less than three months after the flood. Because of damage to their campus, students from Denham Springs were out of class for a month and when they returned to school, they did so in shifts at Live Oak High. Once the basketball team reconvened, they practiced until 8 p.m. before those affected headed home to help with recovery efforts. “They were getting home at 9 p.m., working on houses until 11 and going to school at noon,” said Caballero, who returned to his home the week of Thanksgiving. Ironically, after all adverse effects of unsettled households and attending school into the early evening, hitting the basketball floor for a two-hour practice proved therapeutic for a weary group of basketball players. It was the only time of day where their problems were overshadowed by the dribble of a basketball, squeaking of shoes and piercing noise of Caballero’s whistle. In short, it was an escape that enabled the Yellow Jackets to bond. DSHS began the ’16-17 season with five losses in its first six games. The mental capacity the Jackets showed in closing out tight contest this past season was missing two years ago in games that were decided by 10 points or less. They were 4-9 in those games, a trend that didn’t get any better during a 10-game stretch in District 4-5A play where DSHS went 3-7 overall, losing six of their last seven games and finishing out of contention for postseason play. MORNING UPDATE | Livingston Parish headlines from August 9, 2018! Check out these Livingston Parish headlines from August 9, 2018!